This issue provides a list of the 392 described species of Staphylinidae confined to coastal habitats worldwide. The list is in taxonomic sequence by subfamily, tribe, and genus and includes 91 genera. 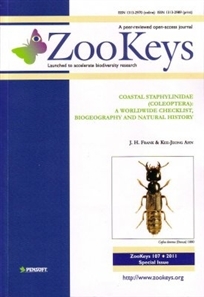 The page reference of the original description of every species and genus listed and of many synonyms is provided. Where existing, recent reviews, phylogenies and keys of each of the tribes and genera are noted.